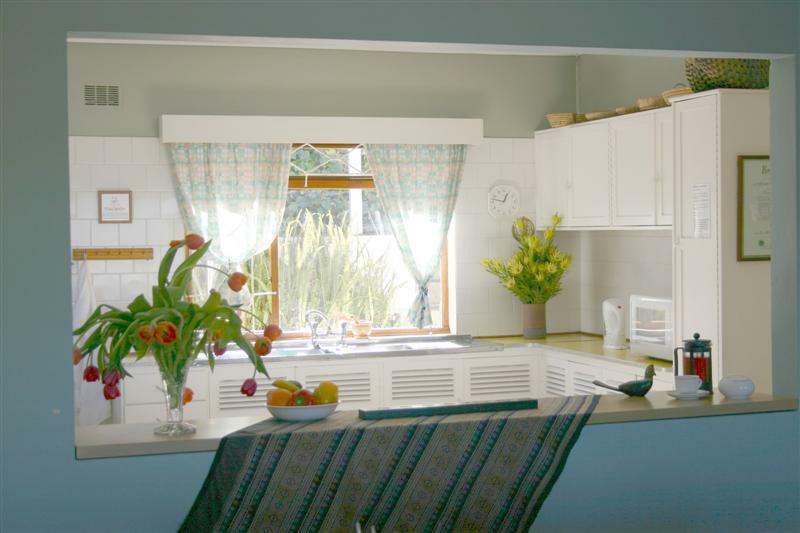 Accommodation in Knysna: Prospect Cottage. 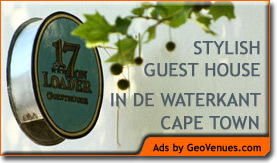 You are here: Home / Western Cape / Knysna / Accommodation in Knysna: Prospect Cottage. Prospect Cottage is a charming, spacious, comfortably furnished three bedroom home suitable for up to six people. We have been operating for 14 successful years, and offer excellent value for your money. It is also an ideal venue for honeymooners as they have space and the privacy of the entire house and garden. A bottle of bubbly welcomes you to Paradise. Sip drinks on the elevated wooden deck with panoramic views of the lagoon and the Knysna Heads or enjoy the view from the lounge/dining room and bedrooms. Relish the tranquil country lifestyle of Knysna with easy access to the Garden Route and Klein Karoo. 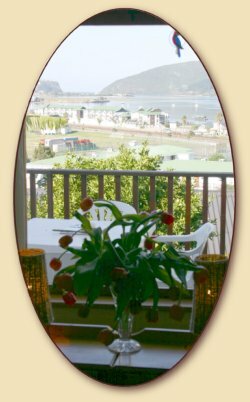 Ideally situated three-minute walk to central Knysna and the lagoon, yet off the busy Main Road. Off street parking available, easy access to boating and water sport facilities, restaurants, shops, and a short stroll from the Knysna Waterfront complex. Secure and hassle free. Lounge/dining room with full satellite DStv installation and a DVD player. We have a small library of DVD. Master bedroom carpeted with queen-size bed and built in cupboards, en-suite bathroom with shower and toilet, built-in safe for valuables and a fan for the summer, wall heater, hairdryer, and toiletries available. Second bedroom consists of carpeted with double bed and built in cupboards, wall heater for the winter, and a fan for summer. The second bedroom overlooks the lagoon. There is also a second TV in this bedroom. Third bedroom, carpeted with two single beds and cupboards. It also overlooks the lagoon and the railway bridge. Full family bathroom with bath, separate shower, basin and toilet. Toiletries supplied, spacious kitchen with stove, oven, and microwave oven, fridge, freezer, automatic washing machine, crockery and cutlery. The kitchen is very well equipped. There are always a selection of teas, biscuits, juice, hot chocolate and filter coffee in the cupboard for your use. Condiments and dish washing liquid are provided courtesy of Prospect Cottage. Wooden deck furnished with outdoor furniture and large umbrella. Linen, bedding duvets, bathroom and kitchen towels provided. Please be so kind as to bring your own beach towels. We have two infant cots and bedding available, suitable for up to 18 months of age. The house has burglar bars and is equipped with an alarm system, which is monitored by a response unit for your comfort. Paved outdoor patio with table and benches and built in braai/barbecue facilities, plus grid and tongs. There is also a potjie pot. Small garden with wonderful bird life. Please note: A minimum of two night’s policy. We do not accept one-night bookings. Maximum of six guests in total, including children/babies. Children are always most welcome. Single rates on request. Approved and accredited by the Knysna Tourism Board. Unit rates differ if there are two people occupying the unit as opposed to six people. Please request a quote or follow check availability’ for your personal and correct quote. The house is always rented out as a complete unit to ensure your privacy. During peak season, there is a minimum stay of five nights.